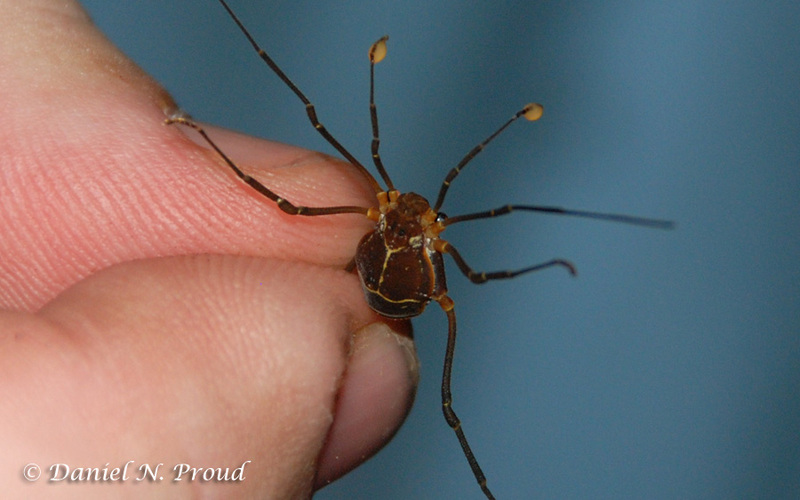 Longlegs fact #4: Harvestmen have repugnatorial glands that produce compounds used in chemical defense. These repugnatorial glands are also known as defensive glands, scent glands, stink glands or odoriferous glands. The repugnatorial glands are a major synapomorphic character of Opiliones. This means that the glands are a derived character, shared among all Opiliones (and their most recent common ancestor), but not among other arachnid groups (though other arachnids may have different chemical defense mechanisms). The glands produce chemical compounds that are meant to deter predators. The chemical compounds produced are very diverse but many are forms of quinones and phenols. The openings of the glands are on the body near the second pair of legs. The harvestmen usually release this secretion when threatened or disturbed. The chemical compounds produced by some species can actually be detected by our own senses. 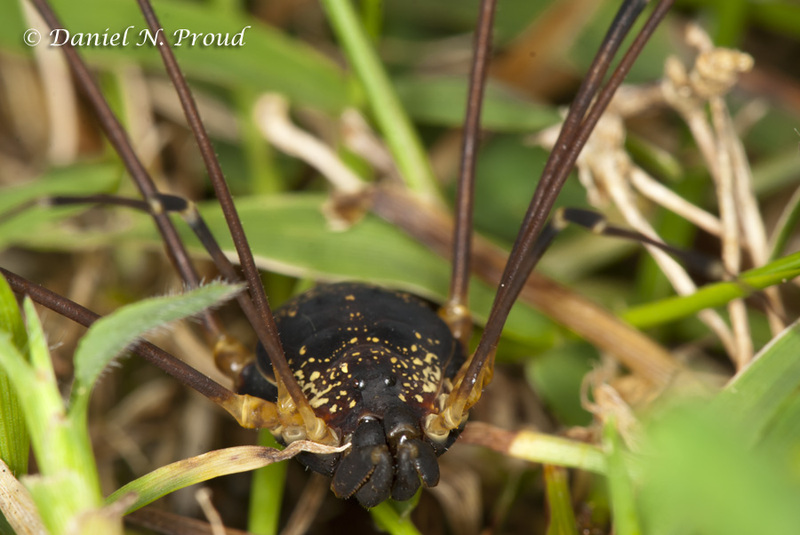 When I collect harvestmen by hand I will sometimes smell them just out of curiosity (despite the crazy looks I get). The chemical compounds produced by some species are surprisingly potent! If I were a natural predator of harvestmen I would think twice about consuming them after getting a whiff of this. And no, I have not tried tasting them! Yet. A species of Cosmetidae using its chemical defenses. The yellow droplet seen on the legs was first produced from the glands on the body and then transferred to the legs. A clear droplet can be seen on the body between legs I and II (on the right side). Eupoecilaema magnum (Cosmetidae), one of the largest cosmetids, from La Selva Biological Station, Costa Rica. Another species of the family Cosmetidae. There are over 700 species just in this one family! 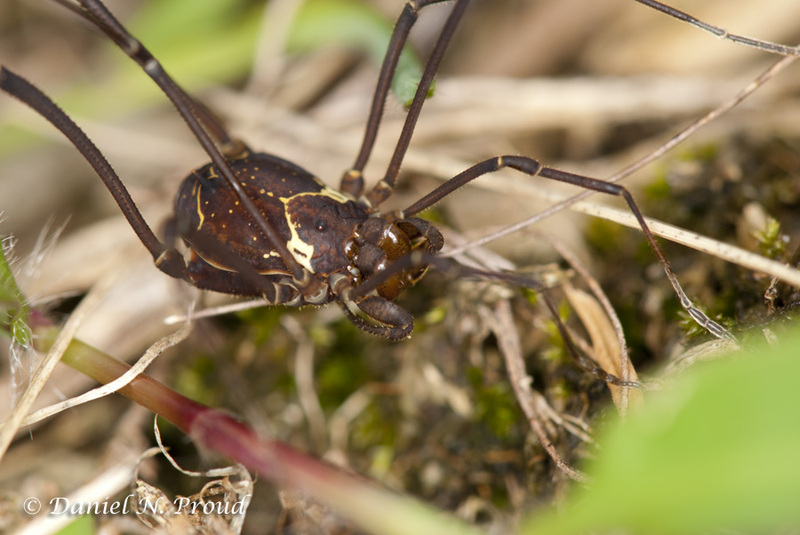 Although there will be many more interesting stories and facts that I will share about harvestmen in future posts, this post will conclude my series on the introduction to the biology of harvestmen. This entry was posted on July 31, 2012 by Dan Proud. It was filed under Arachnid and was tagged with animals, arachnid, Cosmetidae, Costa Rica, daddy longlegs, harvestmen, Macro, macrophotography, nature, opiliones, Rainforest, Tropics. Thanks for sharing so much of your knowledge about harvestmen. I’ve learned a whole lot in the series and look forward to more great pictures and interesting stories in the future. Thanks Mike! I appreciate the feedback. Glad you enjoyed the series. Thanks for following along!